Nestled away in the Southern Caribbean is Grenada and the Grenadines, a small and beautiful trio of islands. Not to be confused with Granada (in Spain), Grenada, also known as the Spice Island, is truly an underrated gem of the Caribbean. You will get to experience all of the beauty of the Caribbean without the swarms of tourists you often find in northern islands like the Bahamas and Jamaica. You can easily reach Grenada on a cruise ship or via a direct flight from North America. As a pre-birthday celebration, I spent four relaxing and adventure filled days exploring the Spice Island at the end of September. 1) Explore Grenada’s chocolate history. 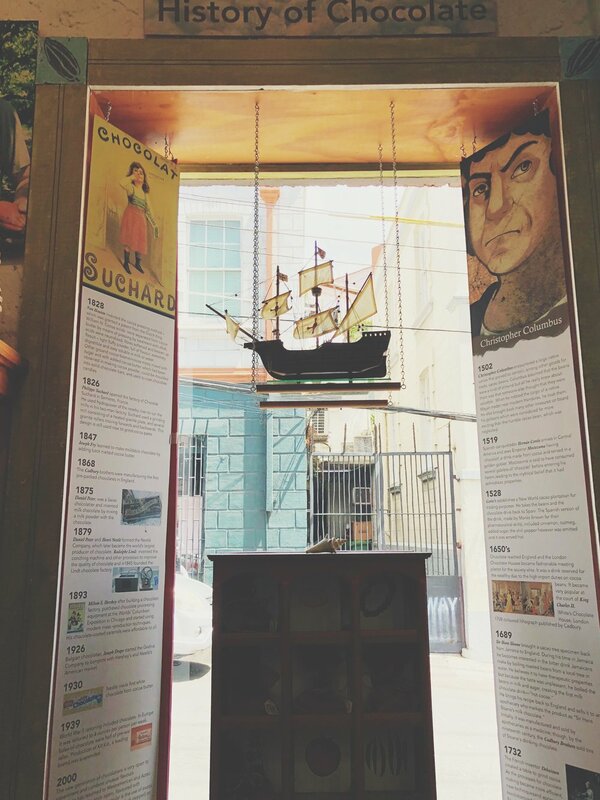 The House of Chocolate is an interactive mini-museum showcasing the history of chocolate in Grenada. You can grind your own cocoa and watch chocolates be made onsite. The House of Chocolate also has a cafe that sells other treats like ice cream, cakes, and drinks. Do yourself a favor and try the mouthwatering chocolate cheesecake! It also has a small boutique shop with an array of things made with cocoa in Grenada. The Diamond Chocolate Factory was rated among the top 10 chocolate factories in the world by National Geographic! We went on a tour of the factory and were walked through the rigorous 10-step cocoa production process. I now have an even greater appreciation for chocolate. Each chocolate bar takes two weeks to make! We went on a chocolate tasting and it was my first time trying 100% cocoa. I found it to be really bitter and not quite to my liking, but it’s loaded with health benefits like improvements in blood flow and reduced high blood pressure. It was also my first time seeing an actual cocoa bean and tasting the seed. In its natural state, the cocoa is a fruit. The cocoa seed had a very sweet flavorful taste to it. Rum is the honorary liquor of the Caribbean. 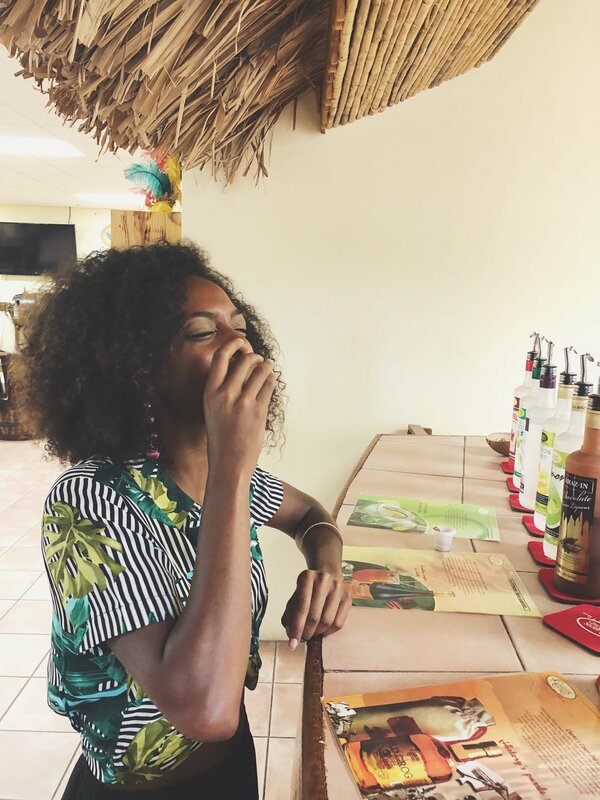 I went on a rum tasting at a local distillery. For 2 USD, I tasted a wide selection of rums, ranging from the most modern blends to the most aged and rarer rums. My favorite was the Old Grog extra mature rum, which was one of the only ones I could drink without squinting my face. Pro-tip: If you are a carry-on traveler like myself, make note of your favorite rums and purchase them at the duty-free at the Maurice Bishop International Airport. The prices are comparable to what you will pay in town. 3) Visit a rum shack. Rum shacks are small local bars located all throughout Grenada. These bars aren’t posh, but are guaranteed to get you drunk fast (if that’s what your heart desires). I found rum shack owners to be marketing geniuses. They know just what to do to attract customers – create a colorful unique insta-worthy background! The owner at Charlie’s Bar created a vibrant tire display marked by Grenada’s national colors, loaded with facts about the country’s history and positive affirmations. Another example of using a fun attraction to pull customers in was the use of a tire hanging from a palm tree, conveniently placed in front of a rum shack. The day before we arrived here, there was a really bad storm. Apparently the storm shifted the sand, making the distance between the ground and the tire way larger than my upper body strength could could manage. We went to the bar across the street to ask for a lift (there was no way I was leaving without getting on that tire). The owner of the bar graciously helped me complete my mission. 4) Upgrade your pantry with spices from the Spice Market. Grenada earned its title as the Isle of Spice for its plethora of cinnamon, saffron, cloves, pimento and their chief export, nutmeg. You would be remiss to leave the Spice Island without bringing home some spices. In the Grand Anse Craft & Spice Market, you will find a variety of spices and products produced by local vendors. It’s a great place to go souvenir shopping. I bought a few mini spice baskets, cinnamon, and Nut-Med, a nutmeg-based spray used for joint pain. 5) Walk along the Carenage. St. George’s is one of the most charming towns in the Caribbean. Its carenage is a natural bowl shaped harbor that is believed to be a sunken crater of an extinct volcano. I enjoyed walking along the promenade and soaking up the view of the colorful fishing boats and pastel-shaded houses rising up on the hill. 6) Catch the best view from Welcome Rock. Welcome Rock, also known as Welcome Stone, is located north of the island and has a mesmerizing view of the smaller Grenada islands. We avoided the initial steep climb by driving to the hike entry point. From there, it’s about a 10 minute hike through lush vegetation to get to the view. 7) Bathe in hot springs. As a result of its volcanic origins, Grenada has several hot springs. Claboney is located in Grenville and is one of the easier springs to get to. You can drive within a short distance of the spring and walk a few yards to it. The 12’ x 4’ pool is filled with warm and sulfurous water. The water is actually pleasant smelling (it doesn’t smell sulfurous at all). 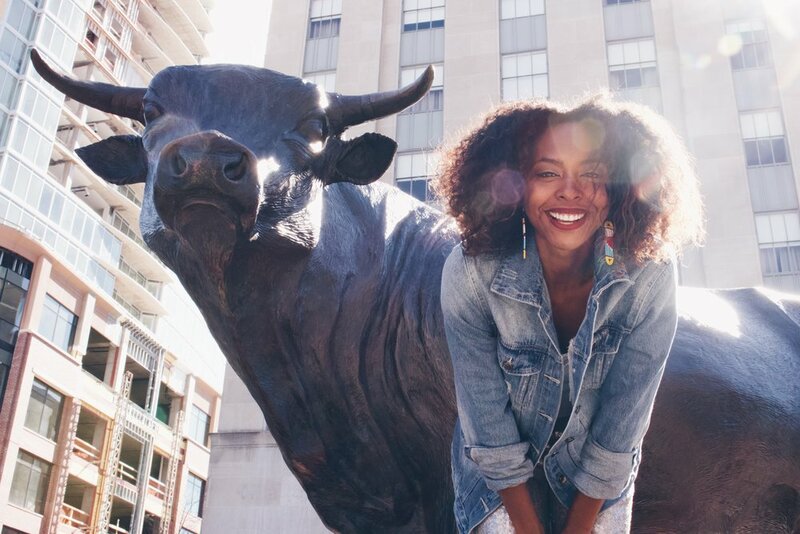 My friend Malaika and I lucked out and had the whole spring to ourselves. It felt like we were in an enchanted forest. Soaking in the hot springs is a great stress reliever and is completely free! 8) Have a beach day or two. 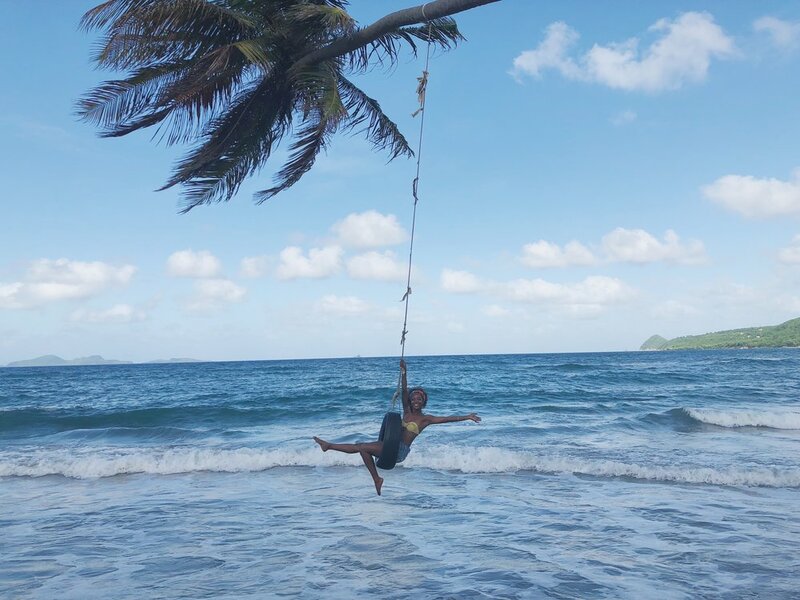 There are 45 beaches in Grenada and they are all free and open to the public. Grand Anse is Grenada’s biggest and most popular beach. Its crystal-blue calm waters and two-mile stretch of white sand makes it arguably the most beautiful beach in Grenada. This beach is particularly special to me because it was my first time swimming in an ocean! I had the pleasure of stopping by Malaika’s family-owned yoga studio, Spice Harmony Yoga, for a quick wall yoga stretch. This was my first time trying wall yoga and it was mind-blowing! The wall allows you to deepen your stretch by opening and creating space in the body using different poses. Located at True Blue Bay Resort is the open-air ocean view yoga studio Sankalpa Yoga. I took a number of their yoga classes during my stay at True Blue. 10) Go on a retreat at True Blue Bay Resort. I didn’t realize day retreats were a thing until I discovered the Scuba Yoga Day at True Blue Bay Resort! This was perfect for me given the short length of my trip. It gave me a chance to try something new— a zen fusion of Yoga and Scuba, as well as the chance to meet some amazing people. Read about my full experience at True Blue’s Scuba Yoga Day here. 11) Take the local mini-bus into town. For the most part, Malaika and I drove around the island. Grenada is 21 miles long and 12 miles wide so you can reach mostly anywhere in the island within an hour. On my last day, I decided to venture out and take a mini bus into town. Grenada has an expansive network of mini-buses that can get you to virtually anywhere on the island. Going into town only cost 2.5 East Caribbean Dollars, which is about 1 USD. When in doubt, ask a local which bus to take to get you where you want to go. If you never had a mini-bus experience in a foreign country, I highly recommend it - the music is always good and it’s a great way to get a taste of local life. I loved my experience in Grenada and I’m already plotting on going back soon! Have you been to Grenada? What were your favorite things to do there?